to preserve and restore natural systems. Our goal in this project is to install imitation beaver dams (Beaver Dam Analogs or BDAs) along Mill Creek in the Emma Wetlands. We can create diverse habitat and help mitigate urban flooding- just like real beaver dams. A group of students from Carman Adventist School came out to the Preserve today to learn about beavers any why they’re important. Educators led the students through the Preserve and to the BDA sites where the eager students learned how to act like a beaver and build a dam. While the primary objective of the BDAs is stream and wetland restoration, they are also an important, unique, and interesting education opportunity for people of all ages. Students from Georgia State University came out this Saturday as part of their annual Panther Plunge day of service. The students helped amend the BDAs as well as helped with some trail maintenance out at our Emma Wetlands property. For the BDA work, volunteers added river rock to either side of BDA #1 and #2 to help support the posts and to give water a slight ramp of sorts over the BDA. Vegetative material was also added to fill gaps in the stone and posts. Thank you to all the GSU volunteers who came out to support these creek restoration efforts! It has now been approximately 1 month since our installation of the first three Beaver Dam Analogs. Nature has been hard at work! 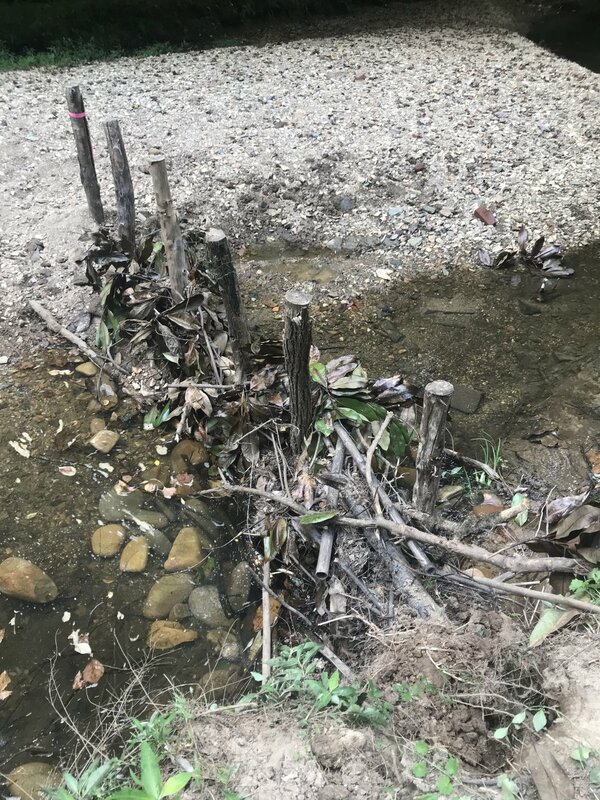 We experienced unexpected effects at BDA #1 and 2, which were not woven, but have seen stick and debris accumulation that has caused sediment accumulation within the creek bed, which appears to have raised the bed. With some work to redirect the flow and provide “splash pads” in front and behind the dam, these are on their way. Unfortunately, BDA #4 experienced failure. Volunteers were able to weave sticks and branches through the dam which “self-sealed” with mud and sediment. Unfortunately the height of the weaving generated too large of a vortex current in front of and behind the dam that undermined the poles and caused them to fall over. The water dug an approximately 3 foot deep hole in front and behind the dam. Learning from #4, the plan going forward is to pursue minor modification to #1 and #2 to provide a gradual build up and splash pad behind the dam and to start with a much lower dam profile than with #4. We will then see if we experience the desirable sediment accumulation to raise the creek bed. As time progresses, we will continue to raise the elevation using additional weaving material. In #4, the current plan is to leave it as is with the weaving material removed and see if the hole will fill in over time and then the support posts can be re-installed. Big summer thunderstorms came through and we anxiously waited to check on the BDAs Monday morning. The one that had been mostly completed was compromised. The posts could not stand up to the heavy flooding. Plans are currently being made to rectify the situation and move forward. The thought is that not enough stone and sand was set upstream to support it. Also, since we were only able to "complete" one BDA before the storms, it did not have any support from BDAs upstream. A work day was scheduled to weave nature materials through the installed posts. We worked on the site where all the posts were able to be installed. Some river cobble was added on the upstream side for additional support. More stone and sand could have been added that day. The pneumatic post driver was found and purchased and an installation work day was scheduled. The crew came out with a bobcat, a large generator, and the post driver. One goal was to get the equipment through the Preserve with as little impact as possible. There was difficulty installing posts into the creek as half way through we discovered bedrock about a foot and a half below the creek bed. For the third site we probed the entire length of where the BDA was supposed to go in, did not find any bedrock, and installed all the posts necessary. We installed half of another BDA further upstream. The posts were set 3 - 4 feet into the ground with 4 feet above ground. 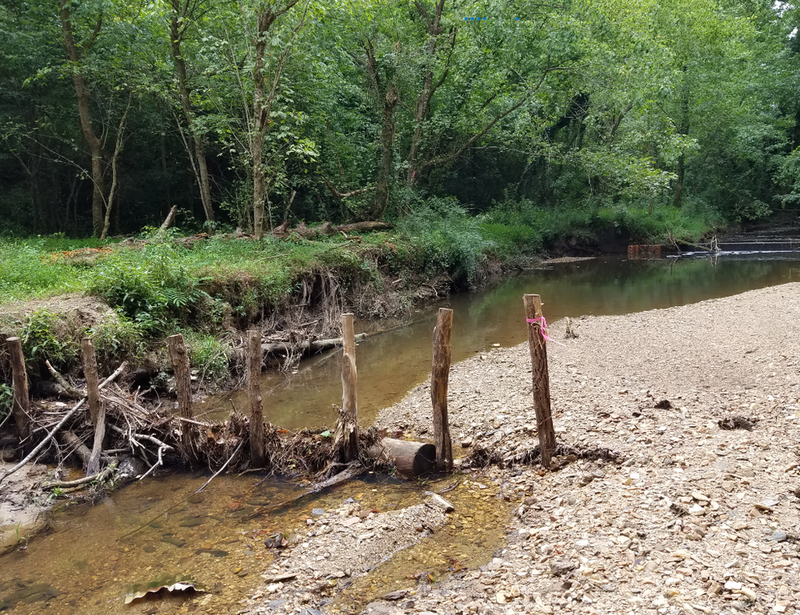 The project has been delayed due to problems with finding a handheld pneumatic driver to drive the posts into the creek bed. We do not want to use any heavy equipment because that would mean damaging the land and potentially the creek bank trying to get the equipment to the project site. We have recently been told that a handheld pneumatic post driver has been found in South Carolina and should be delivered to Atlanta soon. In the meantime, more prep work must be done - 25 more posts were sharpened today and we will continue to sharpen the rest of the 90 to get ready for installation day. Stay tuned for more updates! A work day was hosted to prep posts for installation. Eleven people showed up to help and we managed to sharpen about 40 locust posts that will be driven into the creek bed. Since locust is extremely dense wood, it ended up being much more difficult to cut than originally expected and the two chainsaws that were brought dulled quite quickly. Even still, we managed to make good progress on the posts (100 more to sharpen), and we were even able to stage about one BDA's worth of posts at the site of installation. Originally we planned to cut the posts in a square wedge cut, but because of the difficulty a two-cut wedge would suffice. A sketch of the brainstorming session with Growing Hearts. An organization called Growing Hearts has partnered with us for this project by providing 7 high school students to assist in this work with the mission to grow their resumes for college. For their first work day out of 5, the young adults gathered weeding materials (mostly Chinese Privet pulled on site), as well as calculated how many posts will be needed per BDA and how much river stone will be needed for the BDAs. Per the Beaver Restoration Guidebook, the posts should be between 0.5 and 1 meter apart. Since we have 140 locust posts and each BDA site is about 25 feet wide. We figured we could finish 7 BDAs (about half of the total 13) during this round of installation. The river stone will be used as support for the upstream side of the BDAs. We will use an aggregate of different stone sizes ranging from 2'' in diameter to 8''. To determine how much stone we'll need, we calculated the cubic feet of a rectangular prism that sits like a ramp on the upstream side of the BDA. In the end, we calculated that we'll need 25 cubic feet of stone per BDA. Multiplied by 7 BDAs that gets us 125 cubic feet total. It's difficult to calculate the number of tons we'll need based on the volume because it's hard to tell how well the aggregate will compact, but we estimated 10 tons of river rock to get the 125 cubic feet. Met with the Director of Public Spaces at Ed Castro Landscape, who will be providing equipment and people power to install the locust posts by the end of June. Also met with Lisa Casanova, a professor of microbiology at GSU. Along with her graduate students, Lisa will be collecting water quality data every week at every BDA site to establish specific baseline data. Creek Cross-section Survey Complete. Thirteen BDA sites have been formally identified with stakes and four key creek locations were chosen to perform cross-section surveys. Water sampling at each BDA site weekly began. Delivery of 60 locust posts to be used as the main support for the BDAs. These are sourced by a supplier in Mountain City, GA and are all about 8 feet long and 6 - 8 inches in diameter. Met with key partners for this Beaver Dam Analog project, including local professors and a representative from an environmental engineering firm. From measuring the length of the creek (among other factors), we figured that the creek would benefit from 14 BDAs to raise the water table and connect the old creek bed. Met with Glen to discuss next steps. Decided to plan a site visit with key partners to discuss prep work, research opportunities, timeframe, etc. Initial meeting with Glen Bedhard with the City of Atlanta Department of Watershed to discuss the idea of installing Beaver Dam Analogs along Mill Creek, a tributary of Nancy Creek that flows through a significant portion of the Preserve. Glen is familiar with the Beaver Restoration Guidebook and is supportive of this project and wants to help develop a plan specifically applicable to the strengths and opportunities at the Blue Heron Nature Preserve. It was our first attempt to apply this technique at the Preserve. Beavers had been active on Mill Creek for about 1 year and had built several dams on the current Mill Creek channel. Unfortunately, the heavy water flows from rainstorms, compacted by urban impervious surfaces, blew out the BDA. The intention of the BDA installation was to take and existing beaver dam and reinforce it. The BDA was located downstream from the beaver den which was separated from the main stream channel by a small channel. The hope was to strengthen the dam and back up the water flow such that water would flow into the narrow channel and recharge the otherwise disconnected den to the Mill Creek. It was an all volunteer effort involving our partners from CH2M Hill and Georgia Gwinnett College. We learned a lot including it is exceedingly difficult to drive posts into the creek bed using sledge hammers. The BDA held up initially, but ultimately was blown out and abandoned by both the beavers and us. Since then we continue to promote the idea and look for opportunities to fund this effort.